Continuing from where we left off in the post about how to start a portrait painting, we can paint over of the initial drawing using the color and value relationships we want. There are several directions we can go with this. For example, we could paint in just black, white, and shades of gray to set up the values as a next step in painting. We could also start painting in one location on the painting, working on that area we are happy it is finished, then move on to another. 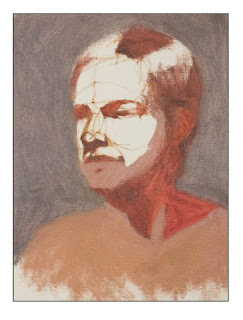 We could also work out the light side and shadow side of the subject as large fields of color then refine the shapes, values, and colors as we work down to the smaller forms. This is the method I chose to demonstrate today. The direction you choose to take in the process is a matter of personal choice. Give it a try, see if it works for you. 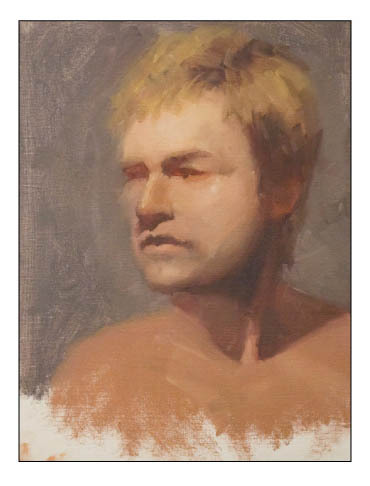 Today, we are going to continue painting a portrait, looking at how to block in the large value and color fields in order to set up the composition for further development. As mentioned in the last portrait painting post, after we have the initial drawing done we can paint the shadow side of the forms of the head and neck. Except for a couple of minor variations I just scrubbed in one color of paint in the shadow areas as if it were one field. This gives the painting somewhat of a posterized look at this stage. To see the steps leading up to this stage click here. Next, we can lay down a background behind the head. I like to do this after I laid down the shadows but before I paint the light side of the portrait. After we get the background down we can start working on the light side of the head, neck, and shoulders. I have been taught to both paint the light side in as one whole field just like the shadow side and taught to break the light side up into smaller forms by value or color at the initial stages. I chose to do the later here, but either way works. Still working on the light side. Here, I worked on the nose, eyes, and hair. 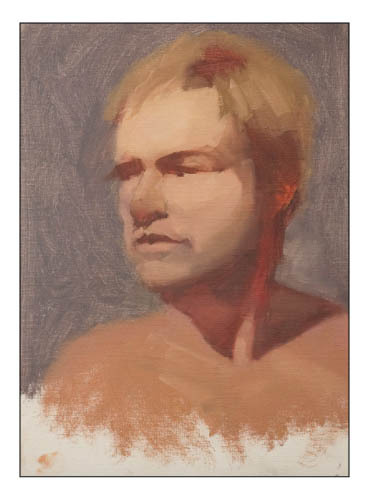 As I continue to work on the light side of the head and neck I put down the darker values then move to the lighter values. In a way, I am painting the lighter value paint color on top of the darker ones. 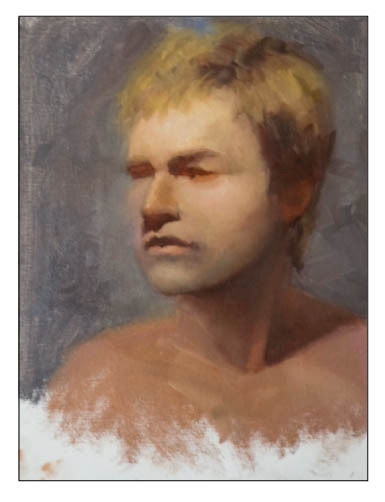 This helps with creating the effect of the light areas are visually advancing and the shadows are visually receding. As a side note, we have divided the composition into three basic values here. Using this process we can make a decision as to what value pattern to use to set up the composition. 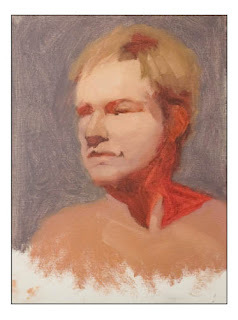 Once we get the light side of the head, neck, and shoulders down we can start cutting out the smaller forms and refining by painting into the larger fields of paint. 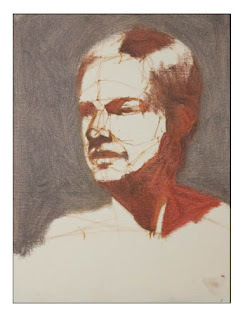 I start by shaping the big forms such as the forehead and jaw then work down to the smaller shapes such the nose. I paint in the light areas first and work my way out to the darks this time. Here I am playing with the color in the face as I refine the values of the forms. In this stage, I am beginning to sharpen the forms to be close to their final appearance. In this step, I have adjusted the chin, jaw, and neck, to correct some of the value relationships and color bringing them more in line with the rest of the head. 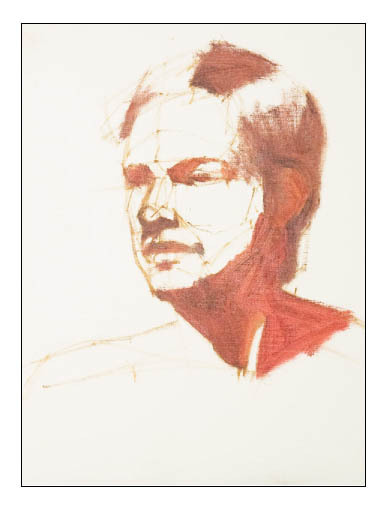 Up to this point we have drawn the initial drawing of the portrait, established the value pattern, and set up the color and values for the portrait. We have done this by grouping the forms into light side and shadow side groups then painting each group as if it were one field first. 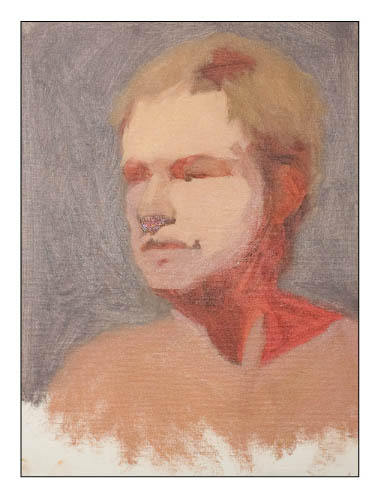 This allows us to figure out the general value and color choices before we zoom into the details.